Afternoon tea is something I happen to know a bit about; so when I don my hat and set out, my expectations are high. A recent visit to Santa Barbara, California, included an afternoon set aside for tea at Four Seasons Resort The Biltmore. This Five Diamond Award hotel is a Santa Barbara landmark. Built in 1927 in the classic Spanish colonial style typical of Santa Barbara, it sits next to the ocean (Butterfly Beach, Montecito) amidst lush landscaping with a tropical feel. Afternoon tea is served Fridays and Saturdays in the Bella Vista Restaurant. With its retractable glass conservatory roof giving one the pleasures of open-air dining without any of its (sometimes) attendant discomforts, the dining room's ambience might be described as California Casual Chic. A wall of windows gives diners expansive views of the Pacific Ocean from nearly every spot in the room. The service was friendly and attentive but unobtrusive--no hovering, but always there when needed. The table was set with white napkins, but they were replaced with black ones for those of us wearing black so that no white lint would mar our clothes. 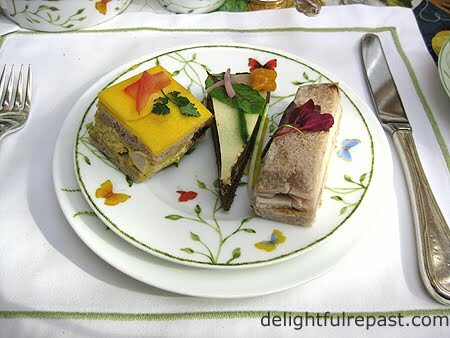 That is just the sort of attention to detail that makes afternoon tea an "experience" rather than just a meal. The sandwiches, more substantial than one often finds, are works of art. Many's the time I have been disappointed by the sandwich course at places I've had tea--dry bread, bad bread, dull fillings, unattractive. Not the case here. Even the toughest tea sandwich critic in my party, the one who always finds fault with the sandwiches wherever she goes (except my house! ), loved these sandwiches. I am often unhappy with the scones when I go out for tea. These scones, one currant and one plain, were delightful. Not too sweet, not too fluffy, not dry, no off flavors from questionable ingredients. The scones were accompanied by strawberry jam, whipped cream and lemon curd. One of my party was a bit disappointed to not have clotted cream, but I actually sometimes prefer the unsweetened whipped cream. The array of desserts had something for everyone. My favorites were the apple tart, madeleine and pistachio cookie. My guests were happy to take my chocolate tart and chocolate eclair, since I'm not a chocolate fan. I ended the delightful repast with an extra sandwich or two and more Darjeeling tea. For reservations, call 805-565-8203 (1260 Channel Drive, Santa Barbara, about 2 hours from LAX). For tea at home, see: How to Make a Proper Cup of Tea and Tea and Scones. Also, my review of the Zojirushi Water Boiler and Warmer, something in constant use in my house! Thanks for your comment, Natalie. I have afternoon tea wherever I go across the nation or in the world. It's my "thing"! Like you say, it is hard to do well. I love the perfect, precise aspects of ritual. I love the comforting reassurance of civilized practices. I love the careful parsing you do of every sensory aspect of breads and spreads. I love, love, love the replacing of white napkins with black for so considered a detail as lint. But...aarhummm, choke, wheeze, gasp…I hate (tea). Oh, is there no limit to my shame? Hey, what can I say? I don't drink it, inhale it, or inject it. Tea by any name is merely contaminated water to me. The stuff even looks tainted (apologies to green tea, orange pekoe etc.). But wait a minute, wait a minute…maybe I'm redeemed. I mean, I LOVE chocolate. Chocolate is good, right? Uh-oh. Well, okay, just feed me from a trough or to whatever is rooting in the trough (but throw in a couple of Tollhouse semi-sweet chips, please). You're probably right about that, Judy! Hey Jean, I agree! A good Afternoon Tea is a true delight to the senses. Many's the afternoon we've spent sipping tea (green is our preferred tipple) and munching on scones, jam and cream. Is there anything more relaxing and civilized? Yes, Grant, "relaxing and civilized." I love everything about it. I drink much more black than green tea, but there are times when only green will do. It has such a refreshing quality. Thanks for stopping by, HH UK! It is such a lovely place, must actually stay there (or "stop" there, as they say in the UK) one day.